Thirty years of warnings and very little has changed. 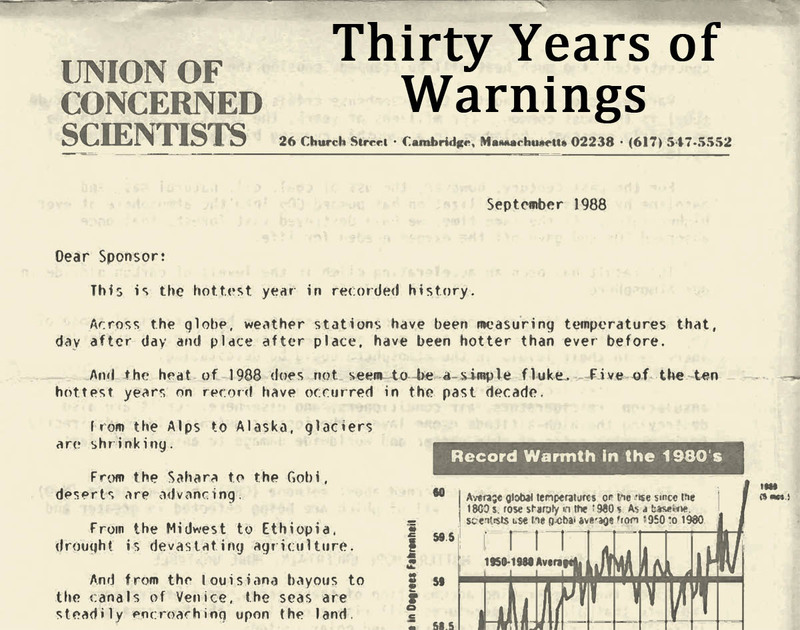 Except for a few numbers, this letter from the Union of Concerned Scientists could be dated 2018 instead of 1988. “Hottest Ever” or “________ of the last _______ years have occurred in the last decade” or “glaciers are shrinking” or “deserts are advancing” or “drought is devastating” or “seas are steadily advancing”: Was this all written yesterday or 30 years ago? they are certainly consistent with the disastrous climatic changes projected from a phenomenon, called the greenhouse effect.” Today or 30 years ago? Impacts are far ahead of schedule. examples; Arctic sea ice melt is 70 years ahead of projections, and Antarctic ice discharge is 100 years ahead of projections.